What happens at Employment Tribunal hearings? 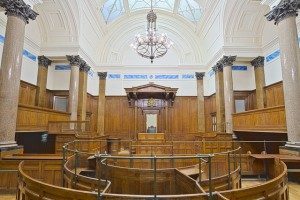 We advise you to attend a day at an Employment Tribunal hearing (they are generally open to the public) in order to familiarise yourself in advance. Call the Employment Tribunal first to see what day is best for viewing the kind of hearing you will be taking part in. Bear in mind there is no guarantee that any tribunal hearing will go ahead, because many cases settle. Hearings normally start at 9.30am to 10.00am. Arrive between 9.00am and 9.30am. After you arrive you will go through security and be directed to a room which is just for claimants or respondents, depending on whose side you are for. Before you go to the Employment Tribunal hearing room the clerk will introduce themselves and (if you are giving evidence) ask if you would like to affirm or take the oath on the holy book of your choice. This decision is entirely for you. Inside the room, normally the two sides’ parties and advocates sit on a particular side. Usually this is signposted on the table. The Employment Tribunal hearing is run by a judge but it is less formal than a court. If this is a discrimination case there will be two wing members to assist the judge with the decision. One will have an employee representative background and the other will have a background in advising employers. You should dress as if attending a job interview. You will be introduced by your advocate (counsel), who may ask you one or two questions; after that, the other side’s counsel will cross-examine you; that is ask you mainly ‘yes’ or ‘no’ questions with a view to showing accepting as much of their case as possible. Don’t worry about helping their case – just answer the questions as they are put to you. Talk to the judge and Employment Tribunal hearing panel members as people. Make sure they hear your answers. Don’t talk at them. Listen carefully to each question. Concentrate on what is being asked rather than why it is being asked (it is tempting to try to take the sting out of the conclusion you think the advocate is trying to reach when you are cross). Answer only what is asked and do not ramble or volunteer information which goes beyond the question. Don’t repeat yourself unless it is an important point which you think may have been missed. At the same time, ensure that your answer fairly answers the question, is not likely to be misunderstood or give a false impression by being too limited. Be exact about what you remember, have a hazy memory about, or are reconstructing from your normal practice. It’s not a memory exercise, so if you recall a document that might help, ask to be referred to it and you will be given an opportunity to read it (all relevant documents should be in the bundle). If your desired answer requires explanation, give the answer first, and then add what is necessary. It is important that you should be seen to be honest, frank, objective and reliable. Thus, try and share your thinking with the tribunal. Do not try to argue your case when you are giving evidence. The effect of your answers is counsel’s worry, not yours. If you tend to become an advocate, your credibility will suffer. Do not speak too quickly as everyone in the Employment Tribunal hearing is listening to your answers. Speak clearly and loudly so that everyone can easily hear you. Avoid looking at the Judge or counsel for assistance on difficult questions. But when you answer a question, talk to each of the tribunal members – you’re at a meeting. If you do not understand a question, say so and counsel will rephrase it. If you cannot remember the facts which would enable you to answer a question, say, ‘I can’t recall’ or ‘I can’t remember’. If you made notes at or immediately after the time of the events to which your evidence relates, you will be allowed to refer to these to refresh your memory if those notes are in the bundle in front of you. If you can only approximate dates, times and distances, give only your best approximation. If you cannot answer a question ‘yes’ or ‘no’, say so and explain your answer. Answer the questions with the words you normally use and feel comfortable with – there is no need to use legal jargon or business terms; for example, don’t call anyone ‘Claimant’ or ‘Respondent’. Be serious and polite in the Employment Tribunal hearing. Do not exaggerate or understate the facts. Do not be flippant. Never argue with counsel or the Judge. Never lose your temper. Be aware that when cross-examining at an Employment Tribunal hearing, counsel may attempt to confuse you, have you argue with him or her, or provoke you into losing your temper. Resist these temptations. Look at counsel while they are asking you a question but speak to the tribunal members when you answer – it makes it easier to keep on track and helps avoid things getting too personal. Some advocates will do their best to rattle and upset you. Only give evidence as to what you personally saw, heard, and did. Objections are much rarer in tribunals than in courtroom dramas. If an objection is made by either side to any question or answer, stop. Wait for the Judge to rule. Never try to squeeze an answer in when an objection has been made. If you need the loo, ask for a break. If you are not giving evidence but observing, you can leave and re-enter the room quietly. Do not talk to, coach, wink at or otherwise communicate with the witness giving evidence. If you have anything to say, pass a note to counsel via your solicitor, and we will try to deal with it at the appropriate time. The temptation when faced with a yes/no question is to not answer it and instead to answer the question you think you should have been asked. This will make you appear evasive and unhelpful. It is better to either answer yes or no, but to state that is not a complete answer and there are other things the tribunal should know in order to be able to understand it. No matter how tempting, avoid giving your opinion as to what others know or concluded. Don’t speculate about what actually happened. Otherwise, if asked your opinion, give it. If asked a hypothetical question you must answer that (contrary to popular opinion), even if it is to say ‘I don’t know’. Being asked if something was possible is a common trick designed to sow doubt about what you say happened. A straight ‘yes’ shouldn’t be given – follow it up how likely you say it was and why. Say so. But consider whether you can say that although you do not recall that occasion you think it likely that a particular scenario would have happened and why, for example “I don’t recall if I typed this document immediately after the meeting, but I think it likely that I would have done as that is my usual practice”. In relation to serious matters, the tribunal will simply not believe you if you tell them you can’t remember. After you have been cross-examined, your advocate will have the opportunity to undo any damage that your answers may have caused to your case. This is called ‘re-examination’. After that, the judge may have questions for you. At the end of the Employment Tribunal hearing, the judge may ask you some questions to review a specific point. He or she will then inform you when a decision on your case will be taken.